It’s a good time to be a Game of Thrones viewer. The seventh season is underway, and episodes 1 and 2 have been excellent thus far. But how is a true fan of the Lannisters, Starks, and Targaryens to pass the time in between their Sunday nights? 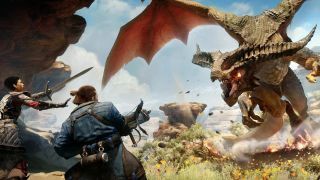 If one hour a week just isn’t enough drama, stabbing, magic, and dragons to suit your needs, then maybe you could curl up with one of these games. It’s got the political intrigue, the dragons, and let’s face it, White Walkers are basically just really big Draugr. The look of The Elder Scrolls has always been unique within the fantasy realm, but this chapter of the video game franchise feels like it could be the setting for a scene about the Stark family. While the visuals are a great match, the tone of Skyrim is more supportive. Game of Thrones mercilessly smacks down anybody’s grab for power, but Skyrim will encourage your efforts to take over just about every faction in the region. One of the standout fantasy game worlds of recent years, The Witcher got very honest about what living in a war-torn world with less-than-noble leadership would really look like. Much like Game of Thrones, the game is explicit about the violence, fear, and stigma that infiltrated all facets of life on the Continent. If the show’s dark realism and strong writing is your main draw, then sink your free time into this stellar role-playing game. Here’s the most obvious way to scratch your Thrones itch. A few studios have tried their hand at translating the books and show into an equally powerful game, but Telltale is the best of them to date. It’s the usual Telltale formula of choice-driven storytelling, and the team has developed a narrative for House Forrester that runs alongside the sagas of the TV show. There are just six episodes in the season, which makes it short enough that you could try out a few of the different paths for the family on repeat playthroughs. As with the source material, don’t get too attached to anybody. All of the machiavellian marriage plots in Game of Thrones have nothing on those you’ll find in Crusader Kings 2. Your entire goal is to further the name and success of your family in this Middle Ages dynastic drama. Marry away your children, kill a couple of rivals, and ensure the glory of your lineage for the ages in this strategy game from Paradox Interactive. You can even make the parallels between game and show explicit with a Game of Thrones mod. This one’s for the people who dream about leading the Night's Watch, protecting the northern border from all manner of foes. But instead of Westeros, your game is set in a world inspired by Viking lore, and instead of White Walkers, the ancient evils trying to wipe everyone out are the Dredge. Banner Saga features turn-based tactical combat as its core gameplay, but the story is also excellent. You’ll be faced with difficult decisions as a leader, and even a seemingly benign choice can wind up having devastating consequences. That’s one thing Jon Snow does know quite well. This is an RPG where you play as the bad guys. Not a cartoonish, mustache-twirling trope of a villain, but the profoundly horrible bad guys. You’re a lieutenant for an evil overlord named Kyros, and your job is to help restore world order in her name. For anyone who thinks the usual paragon-to-rogue morality spectrum is too trite, this is your jam. There’s no option to do good in Tyranny, only to do explicit evil or a slightly less tragic version of it. The game mechanics are every bit as good as you’d expect from Obsidian Entertainment, the brains behind Pillars of Eternity and Fallout: New Vegas. BioWare’s whole Dragon Age series is a clear match for the vibe of Game of Thrones, but Inquisition’s heavy focus on the court intrigues gives it the edge over earlier games. Orlais opens up the whole courtly world of politics and elegantly coiffed backstabbing that wouldn’t be out of place in King’s Landing. And with BioWare’s trademark character and dialogue development, you can find yourself building unusual alliances in your effort to best Corypheus. Just imagine the baddies coming out of the Breach as White Walkers without the chill. Take the vast character list from Game of Thrones, plus all their intricate alliances and dependencies, then drop them into a Konami RPG and you’ll have Suikoden 2. Plot-wise, the game is familiar fantasy fare, with a long journey of building resources and relationships in order to take down the mad heir to the throne. The character development is a real stand-out in Suikoden, and Luca Blight is just as much an antagonist to hate as Joffrey. Making governance decisions with the same swipe-left, swipe-right concept as Tinder sounds great in theory, but Reigns makes you realize why there’s so much nuance in real politics. Your in-game monarchy does need to strike some balance across different factions, making sure that the military doesn’t get neglected or that you don’t bankrupt your kingdom. Lest you get careless, your king will meet an untimely death, as so many Game of Thrones monarchs do. And usually in just as bizarre and unexpected a fashion, like overeating at a party in your honor. If all things scaly and fire-breathing are what gets you tuning into HBO every Sunday night, then Drakengard should be in your game library. It is a decidedly strange franchise, but one with an intriguing plot. Just as Daenerys and her dragons journeyed for all those seasons to make her claim to the Iron Throne, deposed prince Caim allies with a red dragon to fight is way back to power. The sequels get different characters and stories, but the core idea of laying waste to your enemies with a fire-breathing friend at your back stays the same. Check out the whole Drakengard series for more contemporary versions of the concept. Who cares about the machinations of the political leaders. Fans of Arya Stark know that the best part of the show is watching the young assassin wreak vengeance on the many, many, many people who have wronged her and her family. For those viewers, we have Party Hard. In this game, you are trying to kill every single person at a party. Think of it as a twisted, pixellated Hitman game where everyone is your target. And yes, you can poison people’s drinks in the game. Brienne of Tarth is one of the few bastions of honor you’ll find in Westeros. If you’re excited by that approach to fighting, defying all odds in a harsh world, then check out Jotun. In this game, you’re a Viking warrior named Thora who is fighting to earn entrance to Valhalla and escape the fate of an inglorious death. Only by facing down Norse elementals called jotun can Thora find her peace.